Orlando fishing report for January 17th 2018. Red fishing in the mosquito lagoon has been on outstanding levels this week. From schools of 10 fish to schools of 300 fish in near perfect conditions. Low winds and clear skies with temps in the mid 60’s to low 70. This is exactly what Florida is all about folks. The bite has been very good. Redfish and Sea Trout have been the most active bite, taking gold spoons and live shrimp rigged on 1/8 oz. jig heads. With the low winds and gin clear water we can see the fish many yards away and site cast them for an explosive take. This type of fishing is just like hunting with a fishing rod. It’s hard to explain the feeling you get from fishing like this but I can tell you it’s very addictive. 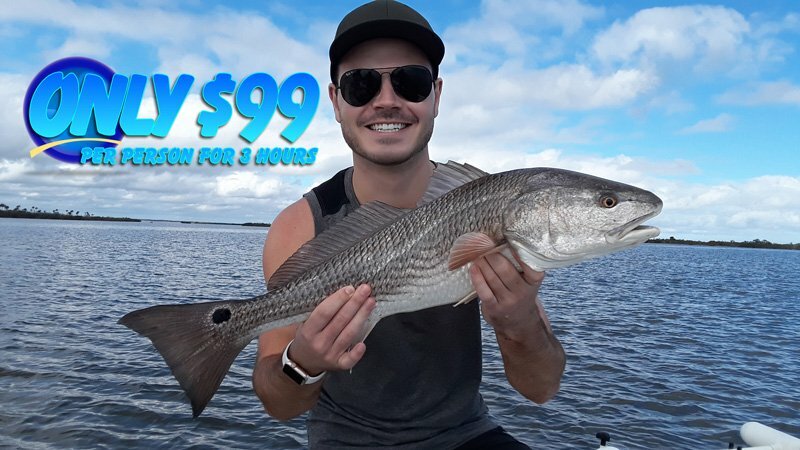 Currently it’s still just $99 for a 3 hr fishing charter while open spots last. That price includes your fishing license, live bait and all tackle-gear needed. Just come on out and bring your sense of adventure. Hi my name is john and I’m interested in your $99 3 hour fishing charter. Im coming down in April and was wondering if you were still honoring this special. It was a limited time only. It’s long gone.